My brother informed me about the following tour to China which is operated by the Dar-Es-Salam. It seems that they have been operating these tours for many years and seem to have pretty good reviews. Disclaimer: I am not affiliated with Dar-es-salam or have not used their services. Please let me know if anyone has gone to this tour and I would be happy to post your reviews here. 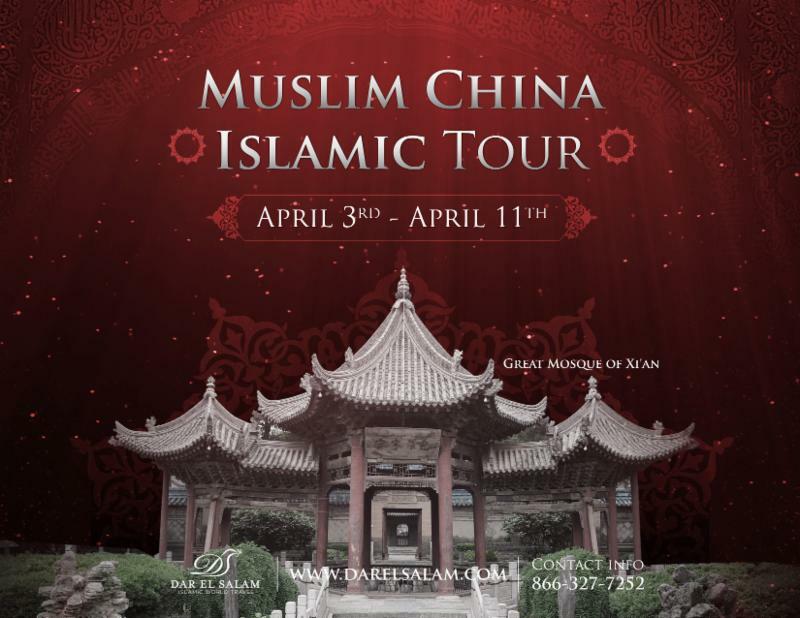 Dar El Salam Travel is excited to announce its first guided tour to China. From the early da’wah efforts of the companion, Sa’d ibn Abi Waqqas (RA), to the pioneering journeys of the greatest naval commander in Chinese history, Admiral Zheng He, Islam has rooted deeply in China through the centuries. 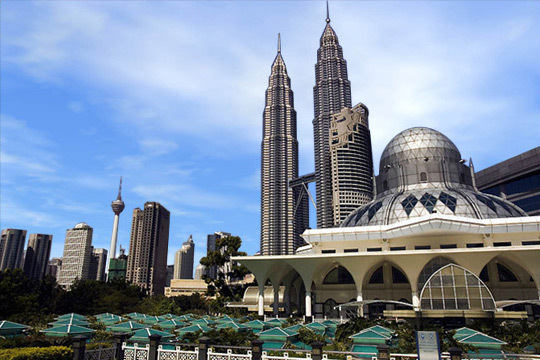 Historical and cultural highlights, coupled with delicious Halal food in our itineraries, will deliver you a unique Muslim tour experience. Learn history and know your Islamic heritage. We will start to explore Beijing from the largest city square in the world; the impressive Tian’anmen Square. From there we will enter the “Imperial Palace” known as the Forbidden City to explore its many fascinating halls and pavilions. After lunch and prayer at Niujie Mosque we will visit the Temple of Heaven, the place where the Emperors worshiped the Heaven for good harvests. Today’s shopping stops are the Muslim Supermarket and Traditional Chinese Herbal Medicine store. Today is the highlight of our China tour, the climbing of the Great Wall of China. In 220 B.C., under Qin Shihuang, the first emperor of China, sections of earlier fortifications were joined together to form a united defense system against invasions from the north. Construction of the great wall continued up to the Ming dynasty (1368-1644), when the Great Wall became the worlds largest military structure. Its historic and strategic importance is matched only by its architectural significance. In the afternoon we will visit the Ming Tomb Sacred Way where we will learn the ancient Chinese Fengshui Theory. On the way to the Great Wall, we will make a stop at Bona jade carving factory where we will learn the ancient art of jade carving skills. In the morning we will visit the largest garden in the world, the Summer Palace. The Summer Palace first built in 1750, largely destroyed in the war of 1860 and restored on its original foundations in 1886, is a masterpiece of Chinese landscape garden design. The natural landscape of hills and open water is combined with artificial features such as pavilions, halls, palaces, temples and bridges to form a harmonious ensemble of outstanding aesthetic value. After shopping at Fresh Water Pearl and Yashow Market we will fly to Xian, the ancient capital city of China as well as the starting point of the famous Silk Road. After breakfast at hotel we will visit the world heritage site of Xian City Wall. Built in the Ming Dynasty between 1370-1387, the 12km long Xian City Wall is the best preserved city wall now in the world. It is the representative of the Chinese rampart architecture at the later stage of the Middle Ages and is the witness of the civilization of the Ming and Qing period with its large scale and well preservation. Later we will visit the Terr Cotta Warriors reproduction factory and the Eighth Wonder of the World, the Terra Cotta Warriors of Emperor Qin Shihuang. The Terra Cotta Army is one of the greatest archaeological discoveries in the world with three exhibition halls, the largest of which is 180 meters by 60 meters, housing the continuing excavation of an army of 8,000 Terra Cotta soldiers and horses that guard the tomb of Qin Shihuang, the first emperor of the unified China. It is a stunning exhibition of ancient artifacts that is well laid out and easy to view. We will visit the Shaanxi History Museum and North Square of Big Wild Goose Pagoda in the morning. Designed in China’s grand and elegant ancient Tang Dynasty style, Shaanxi History Museum is a tribute to Shaanxi’s glamorous imperial past. Considered to be one of most exceptional museums in China, the exhibitions range from ancient bronze tools to Ming and Qing dynasty artifacts. The famous collections include Zhou Dynasty bronze wares, pottery figurines of Qin and Han Dynasties, Tang Dynasty tomb murals and Tang Dynasty gold and silver wares. The Tang Dynasty constructed Big Wild Goose Pagoda is located inside a Buddhist temple. The Pagoda was built in 652 by Monk Xuanzhuang who went to India looking for the truth of Buddhism and as a result he brought back over 600 volumes of Buddhist scriptures from India and this pagoda was hence constructed to store those scriptures. After lunch we will visit the Bell & Drum Tower Square. From the square, we will walk to one of the oldest mosques in China, Xian Great Mosque. This Mosque was built in 742 and underwent several reconstructions in the following dynasties. The existing buildings of this Mosque were mainly built in the Ming Dynasty (1368-1644), and expanded in the Qing Dynasty (1644-1911). The Muslim Bazaar outside the Great Mosque is a great place testing your bargaining skills where you can find almost anything you can think of. Fly to Shanghai at night. We will visit the Yuyuan Garden and its nearby Chenghuangmiao Market in the morning. Yuyuan Garden is an attractive labyrinth of over 30 Ming-dynasty pavilions, built in 1577 for Pan Yunduan, the governor of Sichuan. Linking the pavilions are elaborate rockeries, arched bridges and carp-laden ponds. It is a fine spot for a gentle saunter after fighting our way through the markets stalls. Where the garden meets the bazaar is an ornamental lake traversed by the Bridge of Nine Turnings, its zigzag shape designed to prevent evil spirits from crossing the water. In the afternoon we will stroll along the Bund and Nanjing Road to appreciate early 19th century European Style architectures. We will also visit the People’s Square and one of the best museums in China, the Shanghai Museum. Later we will visit the Xintiandi. Located near the First National Congress of the Communist Party of China, Xintiandi is a newly developed recreation area in Shanghai with old styled Shikumen buildings. Transfer to the airport after breakfast at hotel for your departure flight. Tour ends at the airport. There are limited seats for this special offer and it will be booked on a first come, first served basis. Salaams thanks for this information. Really inexpensive for over a week in China! Very Informative post. But action against muslim in china should be turned of. I want to visit china for the share of the knowledge of Islam and want to working for dawah for Muslim Ummah. I’m trying to populate a list of hotels offering halal food in China and found the following four hotels only so far; can anyone confirm accuracy or suggest other ones?